Step 1 Cook leeks in a small amount of chicken broth. Step 2 Add salt, pepper, and three garlic cloves and sauté until garlic softens. Step 3 Add in remaining chicken broth, chicken and thyme and simmer 20 minutes. Step 4 Add in zucchini "noodles" and cook 5-10 minutes, until desired tenderness. Step 5 Add more thyme, or any other herbs you prefer. This lightened-up take on classic chicken noodle soup is both diet-friendly and delicious. 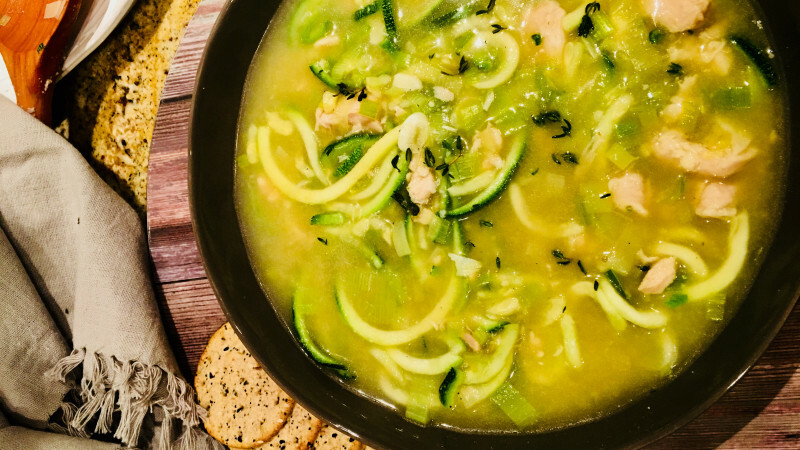 Satisfying soups don’t have to be diet-destroyers, and this healthier twist on classic chicken noodle soup is a formidable replacement for its carb-laden inspiration.